Here at Knox Jewelers, we tend to see all of our custom created design as miniature works of art. 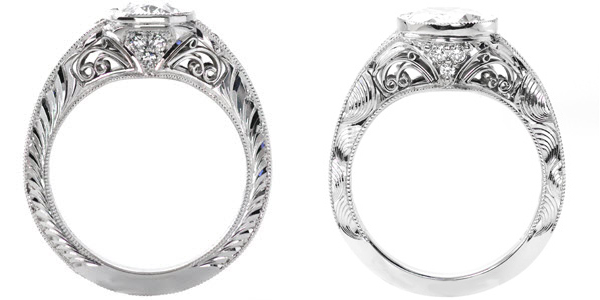 While some ring’s attractiveness can not be denied with their intricate detailing and elaborate silhouettes. Others deliver a powerful statement of beauty with their subtle simplicity and clean lines. Standing the test of time, an elegant diamond solitaire will never go out of style. Selecting a simple engagement ring does not limit the ways you can personalize it to your taste. With metal selections, setting styles and rows of stacked wedding and anniversary bands, your ring can stand out from every other. A custom created engagement ring solitaire can be elegant and simple, as well as unique to you. Our Classic Solitaire engagement ring has always been, and most likely will remain, one of the most sought after and well loved settings we offer. The uncomplicated design allows the focus to remain on the brilliance and beauty of whatever center stone you hand pick to be featured within its four prongs. The Classic Solitaire is timeless, elegant and a great blank canvas to display a one-of-a-kind diamond or colored sapphire. Knox Jewelers' Classic Solitaire Design. We have numerous variations of the classic solitaire available that have been customized with differing setting styles, band shapes, textures and hand engraving. Small details in solitaire engagement rings, like the shape of your center stone or your precious metal selection, are modest alterations that could truly reflect your personal taste and style. By trying out gemstone and metal pairings distinct to you, you may discover a subtle variation on a classic style that perfectly represent you and your relationship. Listed below are solitaire engagement rings grouped by differing center stone setting styles, which would be an important determining factor is the final look of your custom design. Any of the designs listed below, or any others featured on our website, can be crafted in your preferred precious metal and custom fitted around the center stone of your choosing. 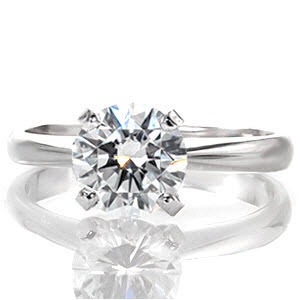 Four prong settings are the traditional approach to the solitaire engagement ring. Four prongs cover the minimal amount of your center stone, allowing more of the gemstone to be seen face-up. A kite set diamond, like the center image, is a variation on the four prong setting that rotates the prongs 45 degrees. This alteration offers a less ‘square’ look. Six or eight prong settings enhance the ’round’ look of a center stone and offer extra security compared to their four prong counterparts. Choosing four double-prongs to hold your center stone adds a regal vintage inspired look to any solitaire engagement ring. A full bezel center setting is a very modern addition to a solitaire engagement ring. In a bezel setting, there are no prongs, instead a thin band of precious metal surrounds the center gemstone. This setting style is growing in popularity for its sleek look and contemporary feel. This setting style is extremely secure, as the center stone is completely enclosed. It can also allow for low-set engagement rings. A half bezel center setting is the perfect compromise of elegance and security. A half bezel solitaire is still encompassed part way by smooth edges of metal but the center stone is not completely enclosed. A half bezel can be featured in may ways, straight or twisted like the images below. If an elegant solitaire engagement ring is the perfect choice for you and your significant other, contact us today. We can start to custom create any solitaire setting by tailored it around your preference in center setting, metal and gemstones selections. Solitaire engagement rings are the perfect start to a customized bridal set with the addition of personally curated wedding and anniversary bands. Nearly anything is possible with Knox Jewelers custom creation. At Knox Jewelers, custom jewelry design is who we are and it is what we do. Custom creating a ring from an idea, inspiration photo or sketch is always a possibility with the help of our design consultants. 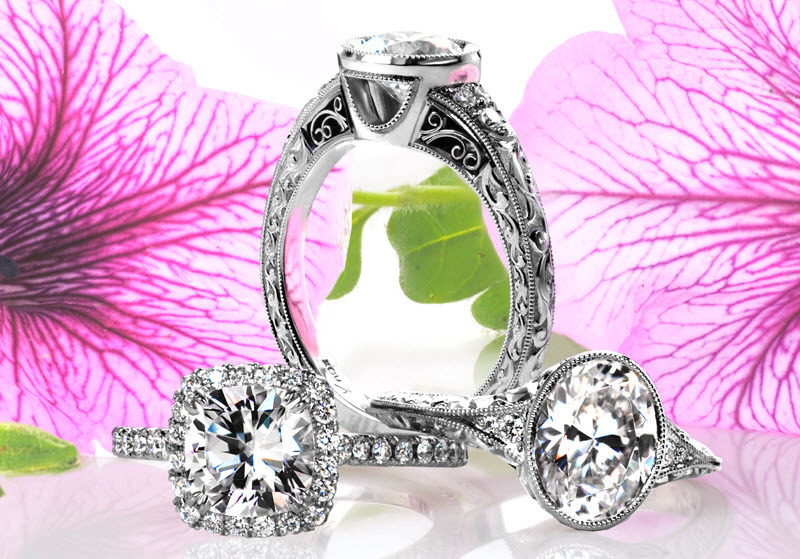 We will work directly with you to bring your engagement ring ideas to life. From hand drawn sketches to computer renderings, we will make sure the design is exactly what you had in mind for your dream engagement ring. We are always up for the challenge of translating even the most uncommon ideas into a special heirloom-worthy piece of jewelry. If you prefer not to work from a completely blank slate, we also have numerous stock designs waiting for you to custom tailor into your one-of-a-kind creation. If you like a ring design you have seen in-store or on our website, we can use that ring as a base to alter with specific details that will make your final engagement ring personal and meaningful. Take one of our most coveted stock custom engagement ring for example, the Rachel Lily . We can manipulate this design in several ways to make it fit your wants and needs. Several of the most common modifications are illustrated below with our Rachel Lily, but these alteration can translate to any of our in-stock designs. Other adjusts could include the addition or subtraction of side stones or replacing these side diamonds with colored sapphires. All of our custom created rings can be crafted in your choice of white gold, yellow gold, rose gold or platinum. Metal selection could play a large part in the final look of your custom created engagement ring. 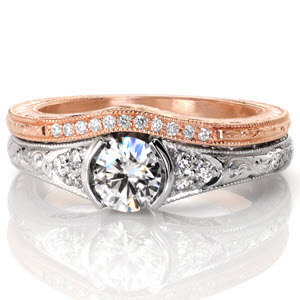 Shown below are alterations that include center stone carat size, center stone shape, center stone setting style, adding a colored center stone, removing or swapping hand engraving styles, and custom shaping the ring shank. Rachel Lily featuring a 1.50 carat oval diamond and Design 2726 featuring a 0.70 carat oval diamond. 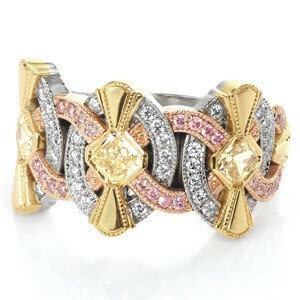 Rachel Lily featured in 14 karat white gold and Design 2545 featured in 14 karat yellow gold. 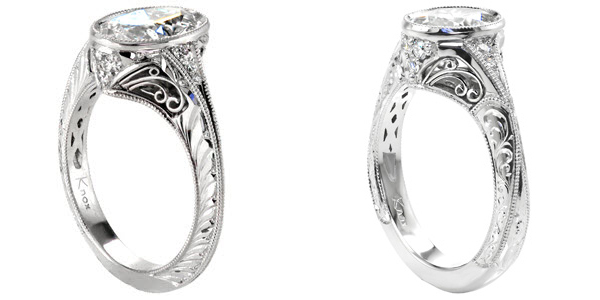 Rachel Lily featuring a full bezel setting and Design 2894 featuring a four-prong setting. Rachel Lily featuring an oval diamond and Design 2750 featuring a fancy yellow oval diamond. Rachel Lily featuring half-wheat engraving and Design 3044 featuring wave engraving. Rachel Lily featuring hand engraving and Design 2902 featuring a high polished finish. Rachel Lily featuring a knife edged band and Design 3031 featuring a modified knife edge band. 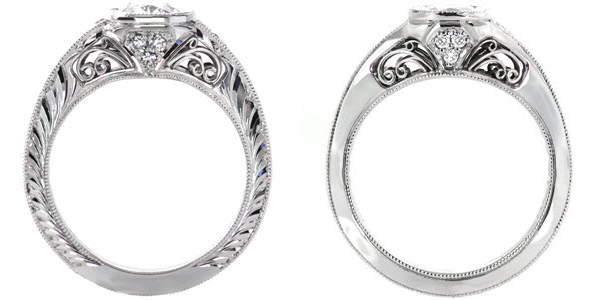 Designing your own engagement ring is an exciting and memorable process. It’s a way for you and your loved one to share something totally unique and one-of-a-kind, a true symbol of your love. Our design process brings you directly in contact with our dedicated designers and jewelers allowing you be involved in every step of the custom process. Do not be afraid to bring us your engagement ring ideas, no matter how surprising they may seem. Most custom alterations are possible, let us bring the vision in your head into a reality. Small details and additions to any piece allows you to tailor your engagement ring into the perfect fit. Contact us today to get the customization process started on your very own unique ring design.